During the weeklong Spring Festival holidays that ended on Sunday, over 3 million trips were made to Northwest China's Xinjiang Uyghur Autonomous Region, an unprecedented 71 percent year-on-year growth, data from Xinjiang's tourism department shows. Over 2.18 million trips, or 72 percent, were made by locals in the region, and traveling has become a popular lifestyle for Xinjiang people to spend the most important festival for family reunion as a result of social development and stability, the department said. Apart from traditional entertainment such as skiing, nearly 300 cultural and travel events were held in the autonomous region during the holidays, including exhibitions of intangible cultural heritage, opera performances, light shows, dragon dances and traditional temple fairs at major tourist sites. The trips generated 3.6 billion yuan ($532 million), a 74.4 percent growth over last year. Winter is regarded as the off-season for traveling in Xinjiang, as temperatures are normally below -10 C or even hit -40 C in some areas. Traffic to mountainous areas is often blocked by snow and ice, said local tourist guides reached by the Global Times. With the development of infrastructure and the local economy, winter tourism has become a powerful growth engine for regions like Altay prefecture, famous for its "powder snow" and a snow season that lasts nearly 180 days. Xinjiang is expected to receive about 300 million trips in 2020, an official from the general office of Xinjiang's tourism department told the Global Times on Wednesday. In 2019, Xinjiang aims to promote 100 flagship travel packages including winter tourism products and travel experiences related to local customs, culture and history, said the official, who prefers not to be named. The ambitious goal comes after the tourism market in Xinjiang skyrocketed in 2018, with the number of trips reaching 150 million, an increase of 40 percent over the previous year. More multimedia products will be placed at airports and high-speed train stations across China to promote travel experiences in Xinjiang, said the official. Local authorities will also reach out to developed areas such as the Beijing-Tianjin-Hebei region and the Yangtze River Delta Region to promote tourism in Xinjiang. The regional government is also eyeing simplified procedures for foreign travelers, said the official from Xinjiang's tourism department. But there's no timetable on this as the process calls for joint efforts from other departments, such as the entry and exit administrations, he said. Most foreign travelers are interested in natural adventure and experiencing local customs in Xinjiang, according to Wang Xiaoli, a tourist guide based in Ili Kazak Autonomous Prefecture for nearly nine years. She has received clients from countries including the US, Italy and Malaysia, Wang said. The most popular sites include the Lop Nur Desert, site of the former capital of Loulan, an ancient Silk Road civilization and other remains of ancient cities, she noted. 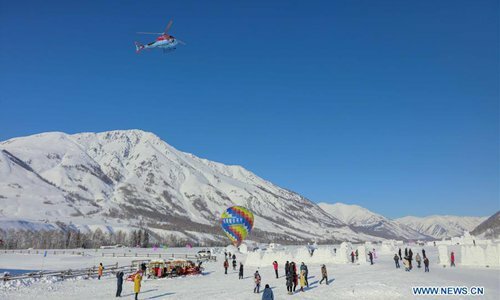 Xinjiang is a place where you can experience the desert, mountain, lake, forest and grassland together and they are no less spectacular or unique than foreign tourist sites, Qin Yan, who took his family from Datong, North China's Shanxi Province to a skiing resort in Altay prefecture for the Spring Festival holidays, told the Global Times on Wednesday. Wang said traveling to Xinjiang is no longer a luxury experience as the cost has been reduced remarkably due to policy support from the regional government and the rapid development of infrastructure, such as tourism trains. In the eyes of Wang, Xinjiang's tourism market is also more regulated and transparent, as there are few reported complaints about shopping scams or violence against tourists. Xinjiang occupies one-sixth of China's territory. It has 21 civil airports, the most among provincial-level regions on the Chinese mainland. Some 49 airline companies operate 257 air routes in Xinjiang. Urumqi is connected with 73 other Chinese cities and 17 countries and regions worldwide, the Xinhua News Agency reported on on February 6. Developing tourism can also help with poverty alleviation in Xinjiang. According to the Xinjiang Daily, the regional government has invested 172 million yuan in 263 tourist programs for poverty alleviation and helped provide jobs to 12,000 poor residents. The Xinjiang regional government's efforts to eliminate extremism and ensure social stability, including the establishment of vocational training and education centers, have contributed to the booming tourism, officials from the region told the Global Times in January.